Thanks for sharing about RGB, Diane. i only know a little about her, being Australian, but like you admire people who can see past ideological differences. it;s a challenge. And Dog Music! Made me want to sing and rush home to visit my own dog. There are no movie theaters anywhere near where I live these days, Diane, but CNN will broadcast RBG on the 9th., I hear, and I can't wait to see it. RBG is remarkable, I don't "get" the friendship with that rat Scalia, but there you go - remarkable people can rise above differences, and we can learn from their example. I know you will love it, Tara! Please be sure to watch the film! I saw it in the theater and was teary-eyed the whole time. Inspiring! Loved RBG. What a precise and beautiful speaker she is. So determined and powerful. Followed by singing with a dog, a hilarious segue. 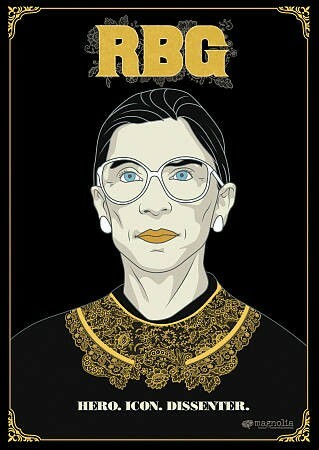 I will watch RBG on the 9th, have read the bio & loved it. I just got the picture book about Sonia Sotomayor, thought I might read it before watching RBG. The poem shows some conection between disparate characters, perhaps Ginsberg sang while Scalia listened & then they switched? Let me know what you think after watching it Linda. The part that stood out for me was the period in her life when she attended law school. The woman was a brick. I'm so happy that I found that poem. It speaks to me in so many ways! Diane, thanks for sharing the information about RBG and hopefully, I will get to see the CNN show. I totally get why you paired RBG and Scalia with this poem. Totally. Its a brilliant pairing, Diane. I just went and requested RBG from my local library. I'm a ways down on the list, but I'm looking forward to sharing the film with Miranda! She will find it inspiring I think! Michelle wrote almost exactly what I meant to: the way, if we are willing to be open to the underlying emotion, we can converse in powerful ways even across species. Happy September! Happy September to you, Heidi, and please keep us informed about your project! I haven't seen the RBG documentary yet (even though my mom has been sharing times and stations when it airs). I do want to find time to watch it. And I loved Dog Music. My brother's dogs lie under the piano and listen when he plays. When they hear songs (from radio or tv) that he has practiced, the turn toward the piano and look confused when he's not sitting there. Thanks for your anecdote about your brother's dog--we should never shortchange them and their abilities.